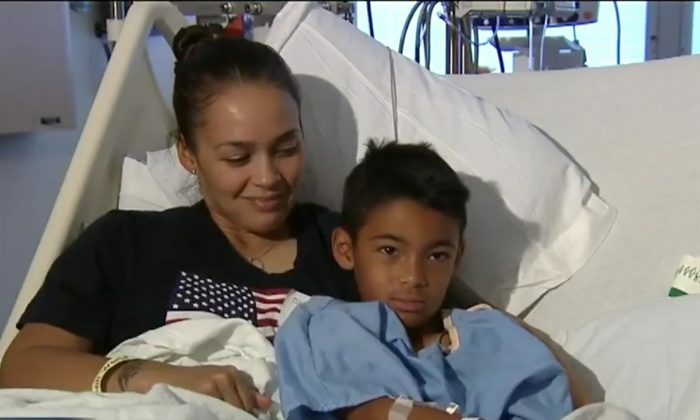 An eight-year-old Texan boy’s heart stopped beating when he got hit in the chest by a baseball while he was playing was playing in a little league tournament on Thursday. After being hit in the chest, Kekoa Ramirez took a moment’s pause and attempted to continued playing, throwing the ball to second base. But he collapsed shortly afterwards, Fox 4 reported. An off-duty paramedic said that Ramirez needed a defibrillator immediately. Ramirez’s father carried his son and rushed him to the Cedar Hills EMT Tommy Perez who was on site at the basefall diamond. Perez said that by the time he got to examine Ramirez, the boy had no pulse or any sign of breathing. Perez found the site of the blunt force trauma—a red circle left by the ball—on Ramirez’s chest. Fortunately with the defibrillator on site, Perez was able to revive Ramirez. The heart, if hit at an awkward time, can experience an interruption to its electrical system and start to beat irregularly—a condition called cardiac arrhythmia. Dr. Matthew Lemlar, Associate Clinical Director at UT Southwestern’s Division of Cardiology, said that these incidents are very rare and surviving them is even more uncommon. If Ramirez didn’t get to a defibrillator on time, he would have died, Lemlar said. An 18-year-old from Binghamton University died after he and a friend were playfully boxing with each other when his friendly slipped a punch into his heart and accidentally killed him, Pipe Dream reported.